My wife reads women's magazines published in Japan. These publications are superior in every way to Vogue, Cosmopolitan, and Marie Clare. They are generally larger and cover more subjects than their American counterparts. One issue contained articles on hairstyle, vacation destinations, the life of an expatriate Japanese woman in Paris, interior decorating and cooking. I can't compare the quality of writing, but the most important pages for me are the ads, and the ads in the Japanese magazines blow me away. 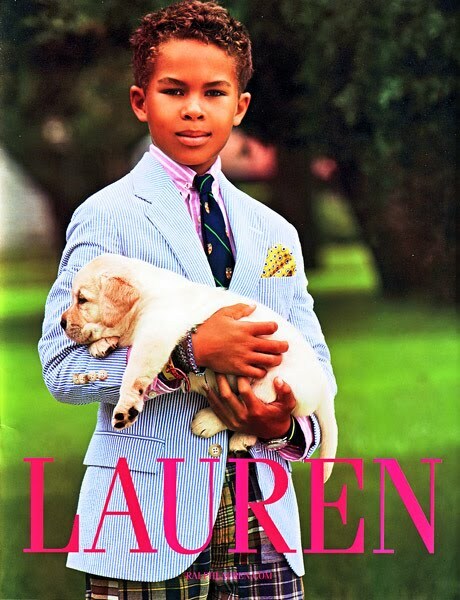 I can't find out if these Ralph Lauren ads were only published in Japan, or duplicated in other markets. Maybe that's not important. Again I am captivated by these images, because they clearly present an ideal to be reached for, an image of life as it could be and should be. The little boy's heartbreaking good looks are only the introduction. He's gone GQ to the extent of wearing a wrist watch and a gold safety pin in his collar. He's at an age where boys can outgrow their clothes in a few weeks, and boys often destroy their garments even sooner. Consequently, parents rarely buy fancy clothes for little boys; it's an inefficient use of money. That's how normal parents [like me] think. This ad wants to turn that around. It says to us, "You aren't just a parent. You are the head of an important dynasty, and you have an image to keep up. Go ahead, dress him up, you can afford it! The impression he makes will be worth it, even if the soft puppy pees in his lap." Japanese ideals of feminine beauty include big eyes, and the bigger the better. The Japanese ideal relaxes a bit on mixed-race or non-Japanese faces and figures. 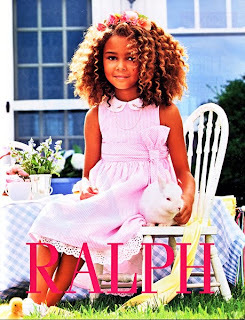 I have never seen a model like this one in American ads. Her chest, hips and hands are wider than the pencil-thin models in America. I don't prefer one type over another. Recognizing the pattern is the interesting, difficult part. Cultural currents affect us unconsciously. Often, we can't perceive them at all unless we see something different, by accident.